This column first appeared in the SA Express-News and its MySA website on June 23, 2015. Dear Mr. Premack: I was recently informed that my aunt died and left a respectable inheritance for me. This may sound odd, but I am doing well and do not need this money from her. I would very much prefer if she had left it directly to my two kids. They are in their early 30’s, establishing families, and could use the money more than me. My accountant told me that I could gift the money to them but there may be gift taxes (or at least a gift tax return). I wish that instead of naming my kids to get the inheritance only if I had already died, she had just given it to them. Do I have any other options? – C.J. If you simply accept ownership of the inheritance, you could turn around and gift it to your children. Your accountant is correct, however, that a gift might cause tax issues. If the amount you transfer to each of your children exceeds $14,000 (in any single calendar year) then you must file a gift tax return. You can tell the IRS that you want to apply part of your lifetime gift tax exemption, which would eliminate any gift tax on up to $5.43 million (but may complicate your estate taxes someday when you die). Instead of the gift route, you have another viable option. Because of the way your aunt’s Will was worded – saying that the inheritance would go to your children if you had died before her – you have the ability to disclaim the inheritance to your children. A disclaimer is an irrevocable election to not receive the inheritance. When done, you would be treated, for the purpose of the inheritance, as though you had died before your aunt. 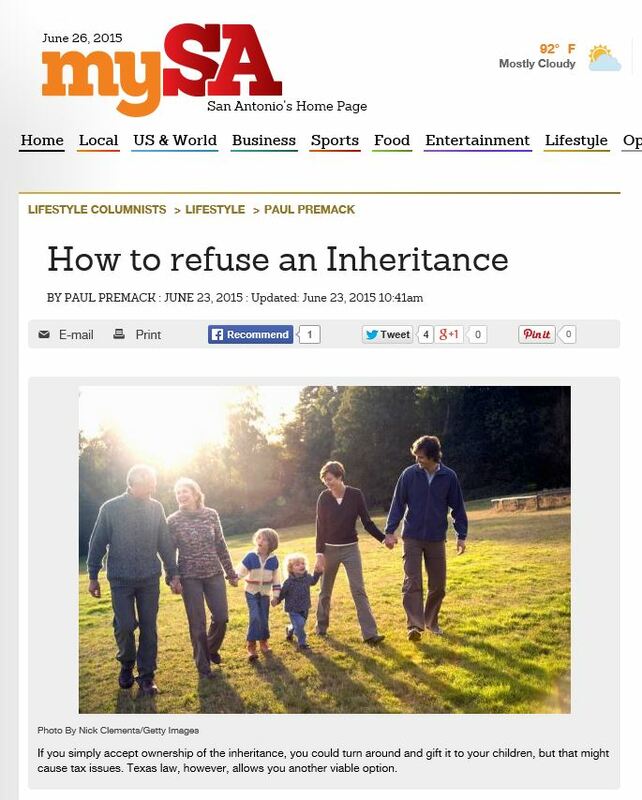 Consequently, your children would inherit directly from her estate. You would no longer be the middleman, would no longer have to be concerned about gift taxes, and would enjoy seeing the benefits of the inheritance accrue to your children. Under current Texas law, the disclaimer must be in writing, must be notarized, and must be filed in the probate matter. The law requires you to disclose whether you have any child support obligations (it sounds like you do not, as your kids are adults). You have to decide about the disclaimer in a timely manner, as the law says this type of disclaimer must be filed no more than nine months after the date-of-death. The filed disclaimer must also be delivered to the estate’s Executor in person or by certified mail. The effective date of the disclaimer relates back to the date of your aunt’s death. Further, if you happen to have any creditors, the fact that you disclaimed shields the inheritance from any claim for payment those creditors may bring against you. If you fail to follow the law step-by-step, the disclaimer is ineffective. Instead of the benefits of disclaiming, your ineffective action is treated as an assignment to your children. Assignment means gift, so it is from you and is subject to all of the gift tax ramifications. Thus, you want to hire an attorney to be sure you handle the disclaimer properly. As you may know, the Texas Legislature recently closed its 84th Session. They have passed a new law called the “Texas Uniform Disclaimer of Property Act”. The bill is awaiting the governor’s signature. If he signs, it will become law on September 1, 2015. The bill removes the Disclaimer law from the Texas Estates Code and places it into the Texas Property Code. It adds new requirements and new procedures. So if you are going to disclaim, you have another motive to move fast so that your attorney can use the “old” law instead of the entirely reinvented new Act.